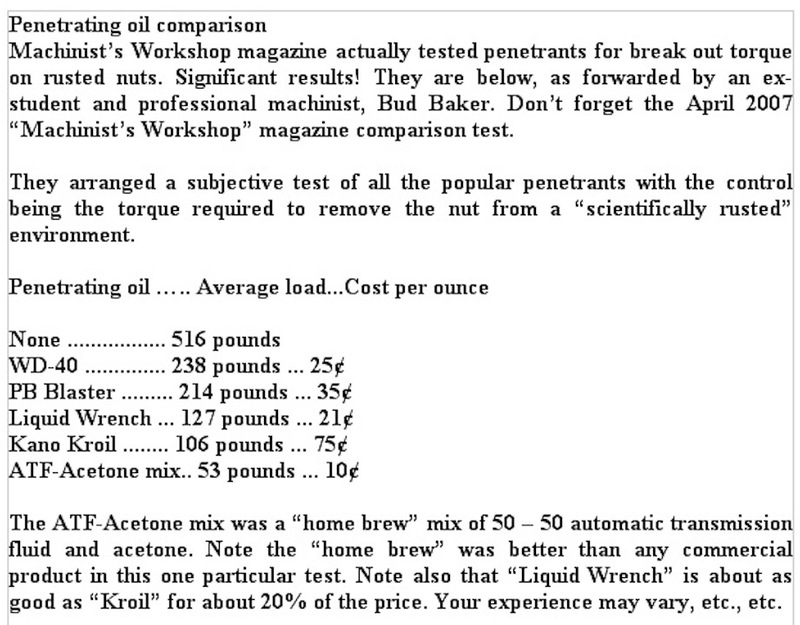 Model T Ford Forum: What Was The Formula Including ATF for Penetrating Oil? What Was The Formula Including ATF for Penetrating Oil? Model T Ford Forum: Forum 2018: What Was The Formula Including ATF for Penetrating Oil? A while back, there was a post about making your own penetrating oil. I believe one of the ingredients was ATF, but I don't remember the other(s). I want to make some up; any help in the ingredients list is appreciated. 50-50 mix of acetone and trans fluid but have never read or heard of it making any difference of the type of trans fluid as in F or Mercon or whatever. Is it a 1 to 1 mixture? Are there any additional ingredients? Kroil - The penetrating oil that creeps! No, it's not 1 to 1. Only 50/50 will work. ATF currently sold is advertised as being for Mercon, Dexron, and other applications. If your going to use it on a Model T Ford you have to use FOMOCO ATF with acetone. Anything else would be a sin! Found a video on fordbarn about this. Some brands mix readily with acetone, others do not. MEK can also be added to the ATF and Acetone mix. I assume that by MEK, you mean MEKP ?, that is used as a catalyst in Polyester resins, glues, body fillers (Bondo/Bog ) and has a very destinctive aroma ?? A highly DANGEROUS chemical, The tinyist splash can blind you in seconds. Methyl Ethyl Ketone. A thinner. Or is it an alyphatic?... I don't remember. Too much exposure perhaps? Prolly won't blind you. I'd been splashed with a catalyzed primer (not MEK) once. OWW! Wash wash wash! Now! Needed glasses before, still need them. Anything other than acetone for the mixing agent? Or is that suggested as it might mix with the ATF? I tried a mix of ATF and some thinner I had here and they hated each other! I thought I had water in there! Methyl ethyl ketone peroxide. Is "MEK" the same or a different compound minus some oxygen ? Better living (or not) through chemistry. Back to the original question, ATF and acetone 50/50 is the recipe. Lacquer thinner contains acetone and other stuff. Just like cooking, if you want consistent results, don't change the recipe. Too many kooks spoil the brothel. I tried it, can't rave on results, but the acetone and ATF I used mixed easily and did not separate. One thing, acetone evaporates at light speed - from its own container and from the mix. If not kept tightly sealed, all you'll have very soon is ATF. Not the sort of stuff you can soak parts on unless they are sealed up air tight. It is my understanding that the purpose of the acetone is only to thin the ATF so that it can penetrate and get down inside the places it needs to get down inside of. After that the acetone is no longer needed. If it evaporates after application, no harm is done. Keep your mix in a tightly sealed container until use. Seal the remainder back up as soon as you are done applying it.